No one will miss the door to this red brick structure because of the startling contrast between the dark door and the bright white columns. 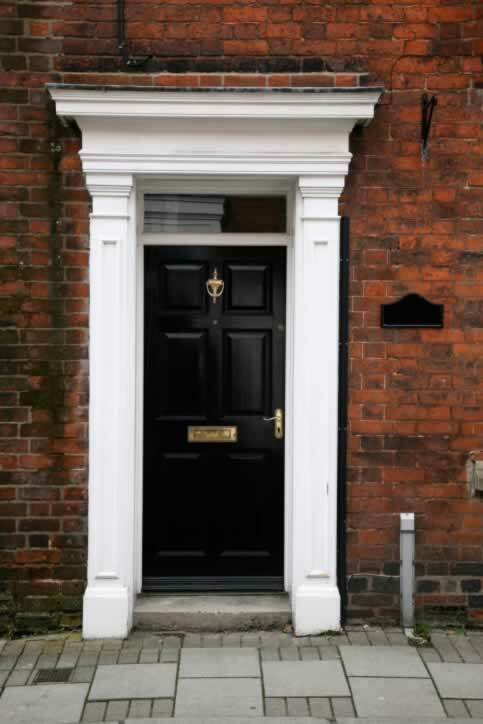 The black exterior six panel door offers a clean and simple design. Each pair of panels increases in size with the smallest panels at the top of the door. A classic brass door knocker, a brass peep hole, brass door lever, and a brass mail slot pop against the door's black finish. The mail slot may have been installed after the door was hung, as the installer chose to center the slot to the edge of the door handle, not the whole door. As such, the slot is not centered to the door's muntin (the horizontal center between the two panels of the door). The white columns and entablature bring attention to the door and give the home a classic appearance.